Governor Andrew M. Cuomo today announced that six members of the Yonkers Police Department are the recipients of the New York State Police Officer of the Year Award. Captain Andrew Lane, Detective Kayla Maher, Detective Dawn Lebzelter, Officer Brendan Moore, Officer Thomas Bennett and Officer Vincent Reda were honored for their actions on Sept. 25, 2017, when they apprehended a gunman who had shot Detective Maher in the face at point-blank range. "Amid chaotic gunfire, these officers diffused a potentially lethal situation and showed exemplary courage, pulling one of their injured colleagues to safety while apprehending the shooter without any loss of life," Governor Cuomo said. "Their actions during this shootout are representative of the bravery New Yorkers have come to depend on to keep our neighborhoods and communities safe, and I am proud to honor them with this well-deserved award." 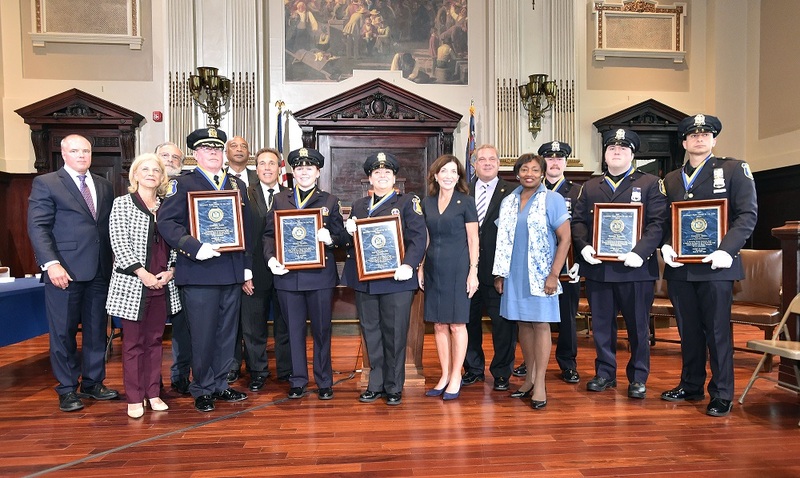 Lieutenant Governor Kathy Hochul presented the six officers with the award on the Governor's behalf during a ceremony at Yonkers City Hall this afternoon. Joining her to present the award were Michael C. Green, Executive Deputy Commissioner of the state Division of Criminal Justice Services and Chairman of the Police Officer of the Year Selection Committee; and Yonkers Police Commissioner Charles Gardner. The award ceremony attendees included family members, friends, and colleagues from the agency and law enforcement executives and officers throughout Westchester County. "This incident could have resulted in multiple deaths had it not been for the quick thinking and decision making these officers exhibited under intense pressure," Lieutenant Governor Kathy Hochul said. "Their heroic actions not only saved the life of a fellow officer, but also lead to the safe apprehension of a gunman who was recklessly firing at them on a residential street. As New Yorkers, we are proud and fortunate to have dedicated officers like these brave six individuals who are willing to put their lives on the line to protect our safety." DCJS Executive Deputy Commissioner and Police Officer of the Year Selection Committee Chairman Michael C. Green said, "What started out as a routine call quickly changed into a life-and-death situation for these officers, including one who was seriously wounded. The officers' collective actions saved the life of an injured colleague. In addition, the officers apprehended a gunman, who is now being held responsible for his actions. Though all the nominations received by the Committee this year are worthy of recognition, the actions of these six officers are truly heroic and representative of the type of conduct this award has come to symbolize." Officers Maher and Lebzelter were dispatched to a report of a suspicious vehicle parked at the intersection of Marshall Road and Ridge Drive. They approached the car and while speaking briefly with an individual in the vehicle's front seat, another individual in the back seat pulled a gun and fired at Officer Maher, who was struck in the chin by a .40-caliber bullet at pointblank range. Officer Lebzelter returned fire along with Officers Reda, Moore, and Bennett, who had arrived on the scene as backup. Officer Moore spotted one suspect fleeing the vehicle on foot and alerted Officer Bennett, who safely took the man into custody while bullets were being fired in their general direction. Officer Lebzelter, meanwhile, calmly apprised other law enforcement arriving on the scene of the gunman's location to avoid a cross-fire situation. Officer Moore devised a plan to reach Officer Maher, who had taken refuge underneath the suspect's vehicle. Officer Reda and Officer Bennett laid down suppression fire that enabled Officer Moore to reach Officer Maher and pull her to safety. Officer Reda, who also approached the vehicle, provided emergency medical treatment to slow Officer Maher's bleeding until she could be brought to the hospital. After nearly 10 minutes of sporadic gunfire, Captain Lane approached the vehicle and took the assailant into custody without further incident. Investigators later recovered a.40-caliber semi-automatic handgun on the ground near the driver's side rear door of the vehicle, in addition to an illegal, large-capacity ammunition-feeding device. Earlier this year, the individual was indicted and arraigned on numerous charges, including four counts of attempted aggravated murder. Yonkers Police Commissioner Charles Gardner said, "Words cannot adequately describe the extreme pressures our officers were under as this shootout unfolded. Their decisive actions and selfless valor in the face of grave danger saved a fallen officer and brought a lethal situation to an end without the loss of life. I am extraordinarily proud of these men and women. Their heroic acts and display of bravery were in the best traditions of our noble profession and serve as an example for law enforcement officers across the state of New York." The Police Officer of the Year Award was first presented in 1984 and recognizes a single police officer or team of officers for an exceptional act of valor symbolizing the service of police in New York State. A complete list of past recipients can be found here. Since the award's inception, 117 officers from 19 agencies across the state have received it. Of those police, 69 have been honored posthumously, including 23 officers from the New York City Police Department and 37 members of the Port Authority of New York/New Jersey Police Department killed during the terrorist attack on the World Trade Center on Sept. 11, 2001. Detective Miosotis Familia, New York City Police Department: On July 5, a man fired once through the passenger-side window of Detective Familia's police truck, striking and killing her. At the time of her shooting, she was filling out paper work during the first hour of her overnight shift. Lt. Anthony Filipski, Cheektowaga Police Department: On Nov. 14, Lt. Filipski responded to a call of an active shooter at a Dollar General Store and apprehended the fleeing suspect without firing a single shot. His actions were captured by the dashboard camera of a police cruiser responding to the scene. Officer Daniel McDade, Metropolitan Transportation Authority Police Department: On March 16, Officer McDade apprehended a robbery suspect who stole a New York City Fire Department ambulance, using it to strike an emergency medical technician tending to the individual who had been mugged. Officer McDade assisted the injured EMT, who later died, and consoled her colleague, all while keeping the physically uncooperative suspect under his control. Trooper Joel R. Davis, New York State Police: On July 9, Trooper Davis was the first on the scene of a domestic incident involving an active-duty soldier from Fort Drum. Upon approaching the residence in the Jefferson County town of Theresa, he was struck in the chest and killed by a .223-caliber bullet fired from an assault rifle. The suspect, who killed his wife just before Trooper Davis' arrival, had been shooting into a shed where an adult woman and two children were hiding. The gunman subsequently surrendered to other law enforcement arriving on the scene. Officer David Capretto, Niagara Frontier Transportation Authority Police Department: On March 15, Officer Capretto rescued a cold and lifeless three-month-old baby girl from a man who had crashed his vehicle into a road barrier during a blizzard and was acting erratically. Medical personnel later indicated that the naked infant likely would have died had it not been for Officer Capretto wrapping her in a towel and placing her inside his jacket for warmth after she was rescued. Lt. Miriam Rubio, Sgt. Hector Martinez, Sgt. Victor Talamini, Officer Jack Collins, Officer Anthony Manfredini, Officer Drew Preston, Officer Sean Gallagher, Officer Anthony Estevez, Port Authority of New York-New Jersey Police Department: On Dec. 11, the eight officers responded to a bombing in the New York City Subway near the Port Authority Bus Terminal. The bomb was detonated in a corridor filled with morning commuters and was intended to kill as many people as possible. The officers entered the smoke-filled corridor despite not knowing whether a secondary explosive device could be on scene. They helped clear commuters from the blast area and incapacitated the would-be suicide bomber after he appeared to be trying to detonate another bomb. Deputy Thomas Munzert, Wayne County Sheriff's Office: On July 15, Deputy Sheriff Thomas Munzert responded to a crash involving a motor vehicle that was overturned on its roof in a pond. Without safety equipment, he entered the pond and pulled the driver to safety from the submerged vehicle. Holding plaques from left to right, Captain Andrew Lane, Detective Kayla Maher, Detective Dawn Lebzelter, Officer Brendan Moore, Officer Thomas Bennett and Officer Vincent Reda.